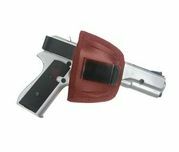 Slide Leather Holster is made of genuine leather and has belt loop and sturdy steel clip. Ambidextrous holster, right or left. Can be worn outside or inside pants. Has belt slits as well as clip. Comes in black or brown color.